Amquel Plus removes toxic organics but does not alter pH. It quickly detoxifies chlorine and chloramines commonly found in tap water. 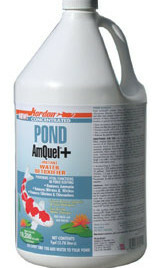 A must have conditioner for starting up your new water feature, as well as for use during continued pond maintenance. Protect your pond&apos;s fish and aquatic life from the dangerous toxins created by fish waste. 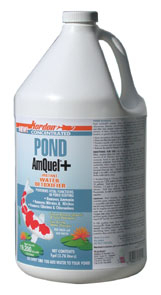 Pond water conditioner instantly detoxifies ammonia, nitrate, nitrite, chlorine, and chloramines in your water without harming the beneficial bacteria that are working to keep your pond clean. Safe and easy to use without raising your water feature&apos;s pH levels.